Cometh June, cometh free theatre at the Dell, Stratford-upon-Avon’s outdoor stage at the upper end of Waterside, by the river. 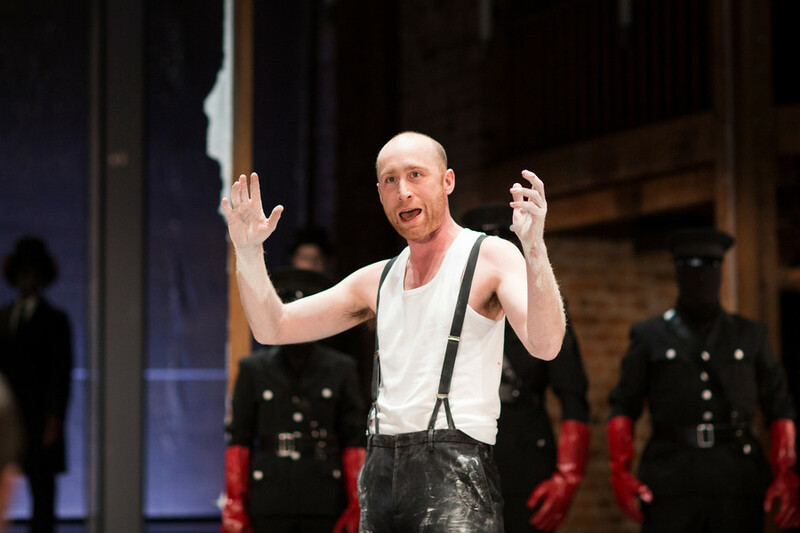 The opening show, Shakespeare’s Much Ado About Nothing, was presented by a clever mix of RSC staff amateur actors, Shakespeare Institute students and current RSC actors, and directed by James Corrigan – with just one daring week of rehearsals. 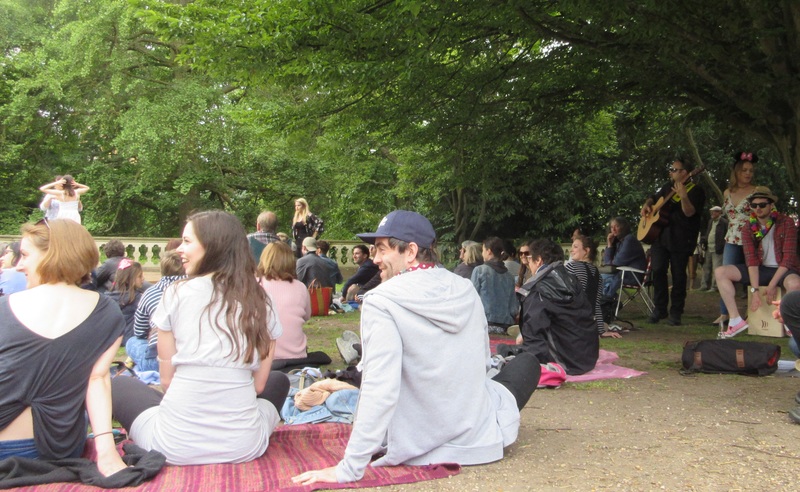 A cheerful, large audience came together, picnic blankets, matching hampers, raincoats, brollies, kids, dogs and all. 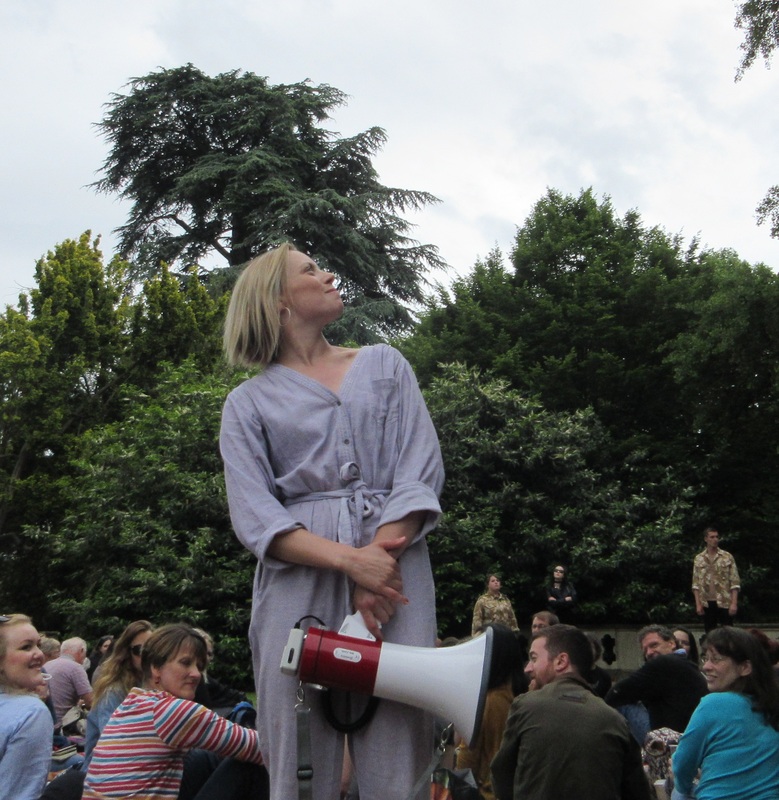 The play was everywhere, in the midst of the audience, under and on trees, vibrating all around. What joy, dynamic, what a sparkling display of fun ideas. Brilliant work by amateurs and pros alike. 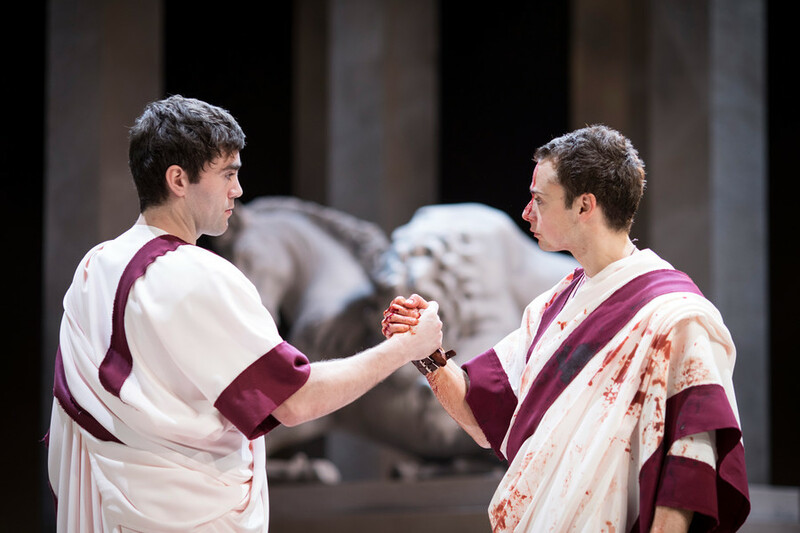 Particularly thrilling: Lucy Phelps as Beatrice and Rhys Bevan as Benedick, perfect chemistry and glorious banter. Also utterly believable in a female version: Don John, the evil brother, played by Grace Martin. 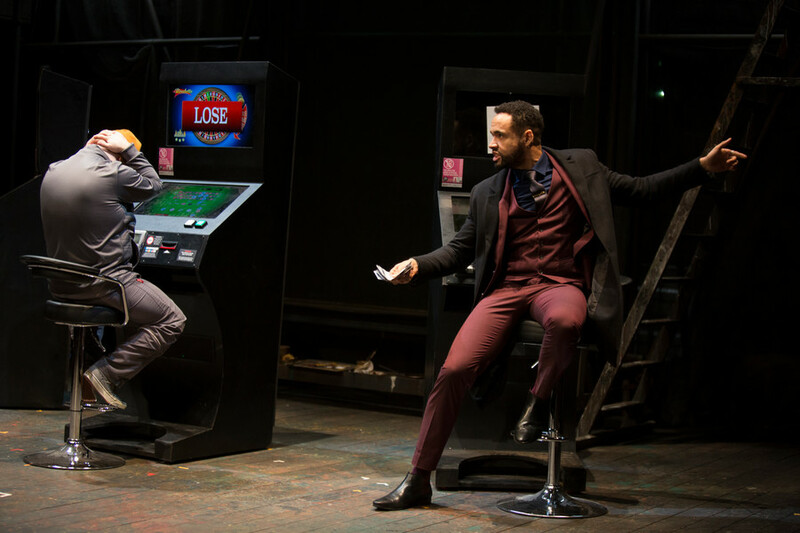 The watch, by Naomi Jacobs, Andrea Moon, Leon Peckson, George Sothcott and Annie Wilson delivered their play-within-the-play as a serious laugh muscle exercise. With prescience set up under a well leafy roof, a live band accompanied the show, inciting little jigs here and there. 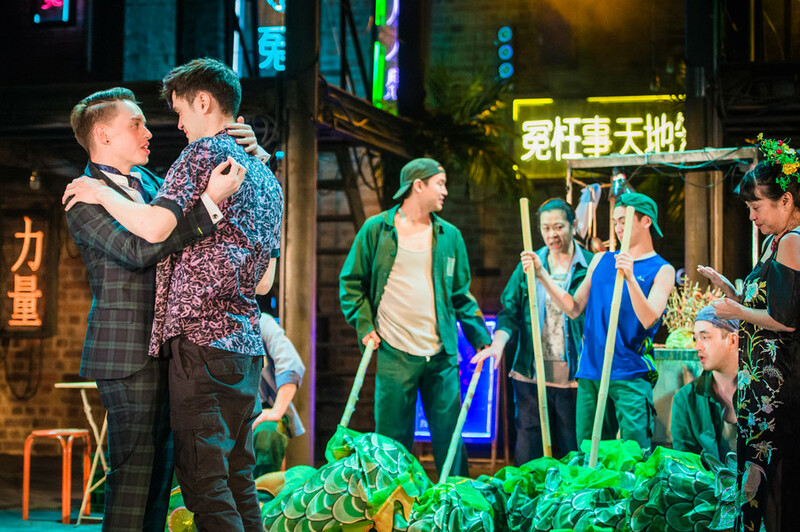 Under the usual conditions of an English summer, two short showers couldn’t be danced away entirely, but the well-prepared audience was not for turning away from this delightful production. 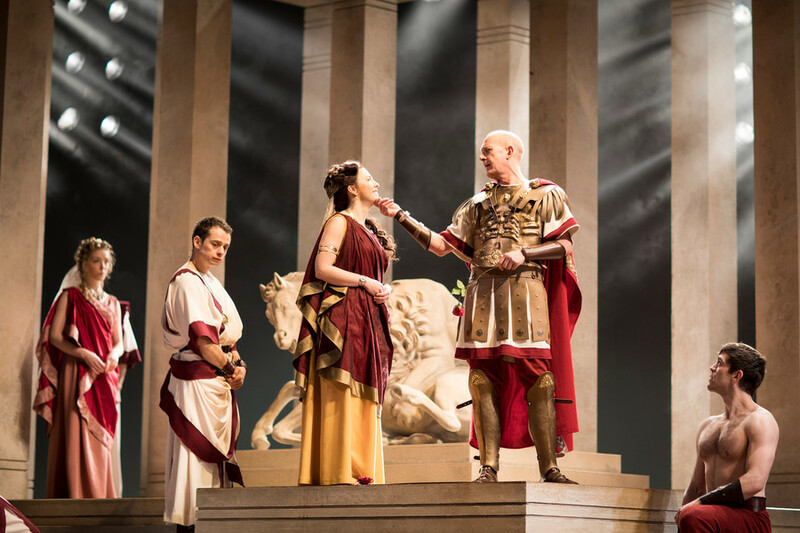 This entry was posted in Theatre, Uncategorized and tagged James Corrigan, Lucy Phelps, Matt Heighway, Much Ado About Nothing, Rhys Bevan, Stratford-upon-Avon, William Shakespeare on June 5, 2017 by lingonews. 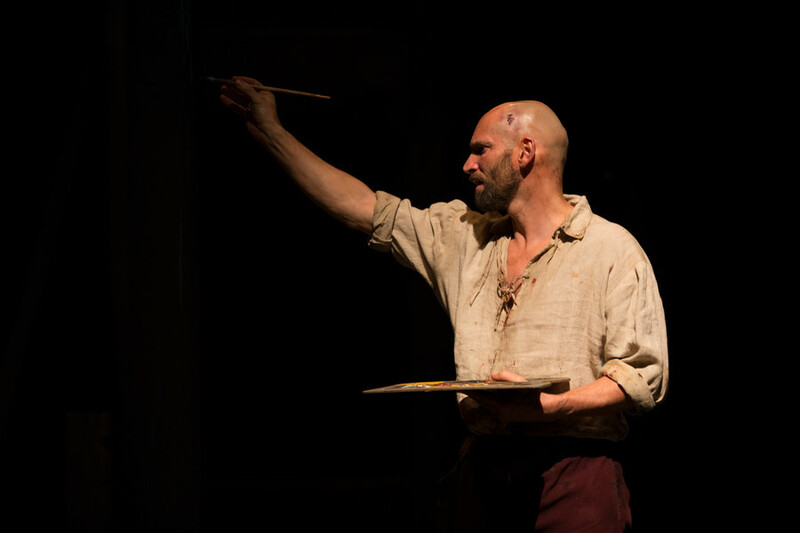 From Naples 1606 to Bootle near Liverpool 2016 – from food banks and bedroom tax to a painter’s genius and demons spans the bridge that is brought together in an emotionally exhausting, gripping play. Caravaggio has just fled from Rome where he is wanted for murder. A church in Naples and a commission to paint the Seven Acts of Mercy become his sanctuary. 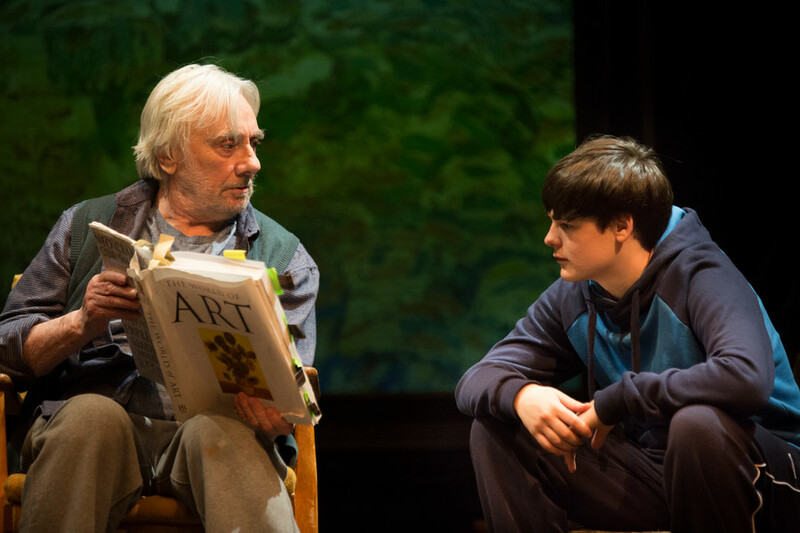 In present day Bootle, a young boy and his dying grandfather are only just getting by, until the disastrous consequences of austerity are being handed down to them. It is a stroke of genius by playwright Anders Lustgarten to subtly and unpretentiously draw on the 7 Acts of Mercy (feed the hungry, give drink to the thirsty, clothe the naked, shelter the homeless, comfort the sick, visit the imprisoned, bury the dead), including the related sensitivities – in the light of the current political and social climate – as a lifeline for crumbling communities. 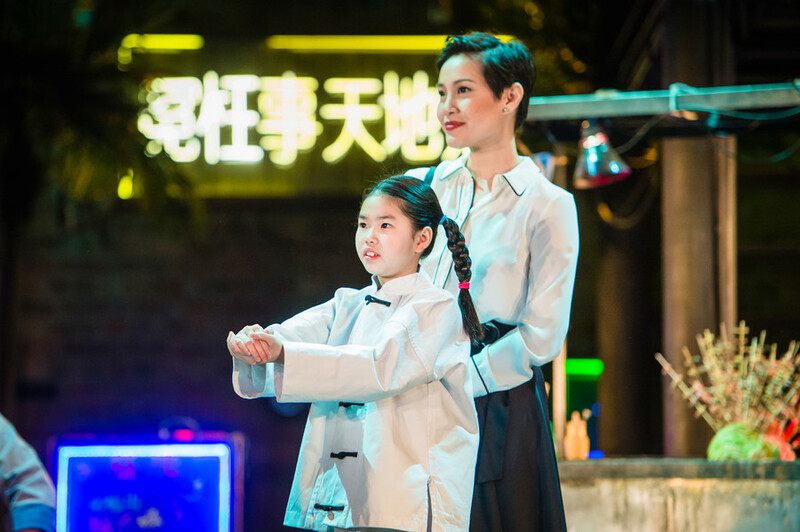 The edge-of-the-seat feeling remains strong throughout the play. Fun moments and thrown in edification in art history can only momentarily divert from the sensation of sitting on a dangerously vibrating tectonic fault. Violent but defenceless, raw as if flayed is Patrick O’Kane’s breathtaking rendition as Caravaggio, a character that won’t let you go. 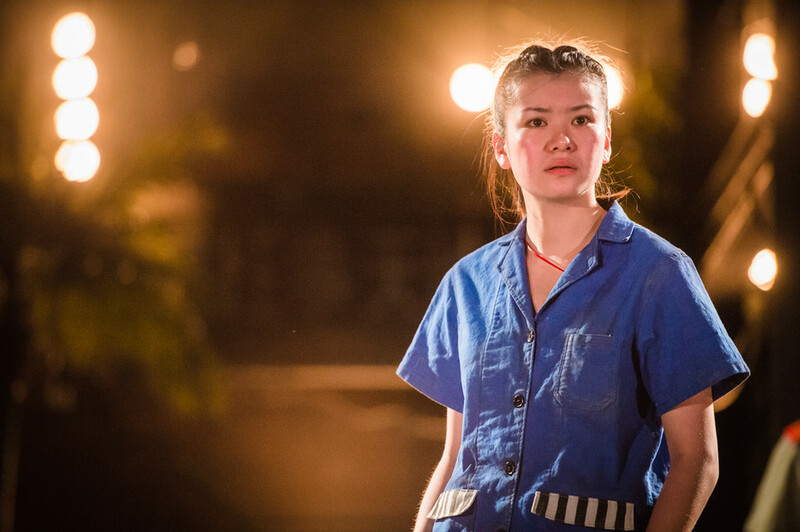 His model and kind of friend, prostitute Lavinia, a tough job superbly performed by Allison McKenzie, fences on a very tight rope, vulnerable, proud and scorching. Further in Naples: Edmund Kingsley as the Marchese, in a delicate portrayal of one of the very few balanced characters in the play. Or is he? 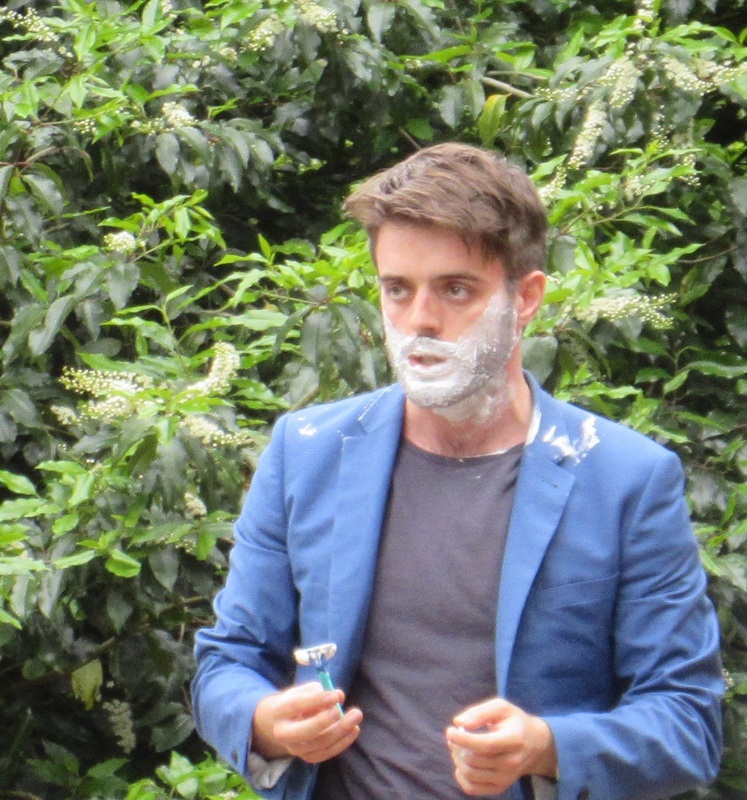 And then James Corrigan as Vincenzo … to be found out. In Bootle, Tom Georgeson as Grandpa Leon is a deeply touching character trying to pass on hope in hopeless times and he poignantly depicts pride and loss of a worker’s life. Incredibly talented, young TJ Jones as Mickey carries most of the current day action, and he does it with an ease that would make an old hand proud. As scary henchmen, Leon Lopez and Patrick Knowles: sardonic and weirdly funny, in true Pulp Fiction tradition. Further in Bootle: Gyuri Sarossy as Mickey’s father Lee: an achingly torn figure; Paul McEwan as Damian, recently arrived on the losing end; Paislie Reid and Nicky Priest as Siblings Jennifer and Danny; Lena Kaur as Karen, officiating for the battered Council; Sally Bankes as Sandra at the food bank; Eloise Seeker as Emily, the Labour representative. 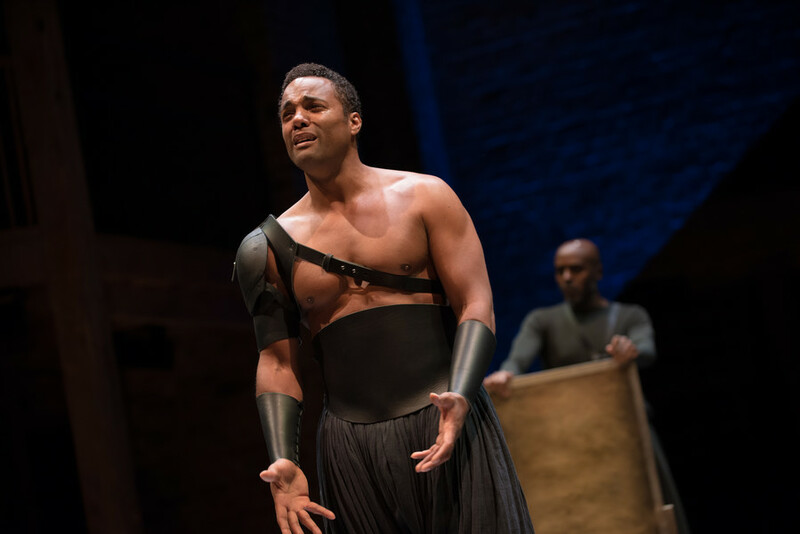 A spirited and passionate ensemble play, directed by Deputy Artistic Director Erica Whyman. The set design is yet another subtle thought amplifier by Tom Piper. This entry was posted in Theatre and tagged Allison McKenzie, Edmund Kingsley, Eloise Seeker, Erica Whyman, Gyuri Sarossy, Isobel Waller-Bridge, James Corrigan, Lena Kaur, Leon Lopez, Nicky Priest, Paislie Reid, Patrick Knowles, Patrick O’Kane, Paul McEwan, Royal Shakespeare Company, Sally Bankes, Swan Theatre, TJ Jones, Tom Georgeson, Tom Piper on November 28, 2016 by lingonews. Faustus and man’s eternal temptation to sell his soul. 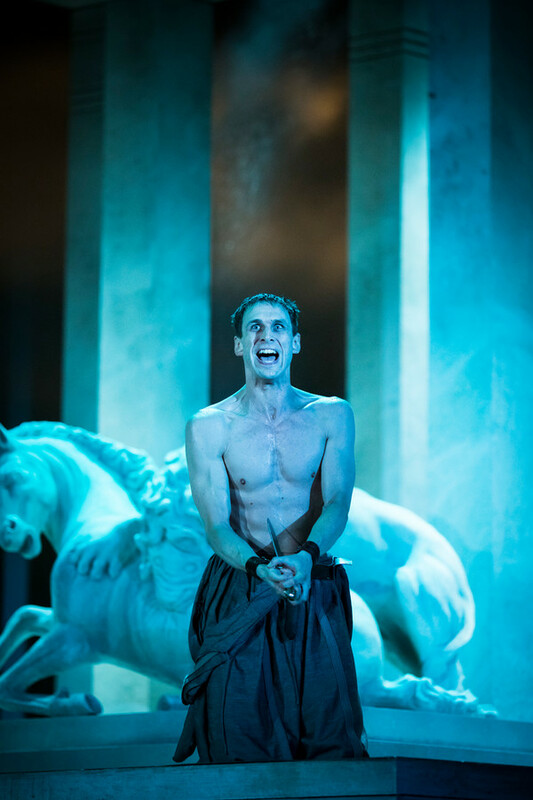 Marlowe and Goethe take their title character from the same source, but Marlowe’s Faustus is, like Marlowe himself, an enfant terrible, a hectic, restless, indomitable and intellectually insatiable genius. 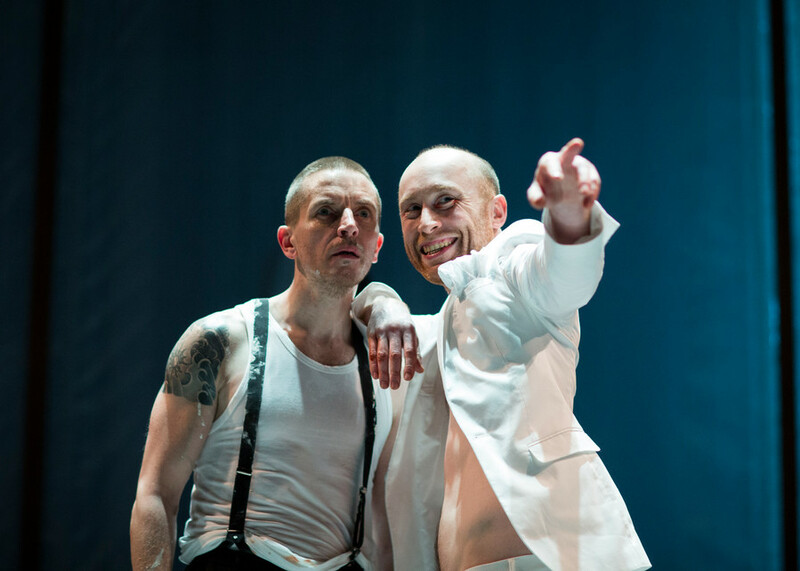 In this production, directed by Maria Aberg, one aspect is clear from the very beginning: Mephistopheles and Faustus are one, evil does not lurk outside or in other people. It is the result of human free choice and ponderation of interests – be it for the sake of knowledge or be it to satisfy the traditional addictive habits that Marlowe presents in their categorisation as seven deadly sins, a term used since the times of early Christianity: pride, covetousness, envy, wrath, lechery, gluttony and sloth. 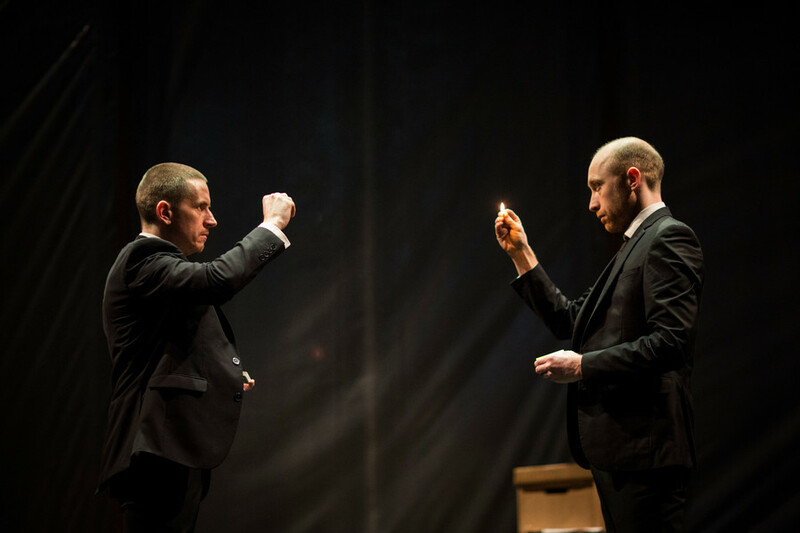 Oliver Ryan and Sandy Grierson appear on stage, dressed alike, and they each light a match. He, whose flame goes out first, plays Faustus. His past life is standing around him as books in boxes, unsettled, and he is cursing the limitations of available knowledge. Magic, and therefore in the logic the late 16th century, hell, is supposed to satisfy his need for insight and repute. 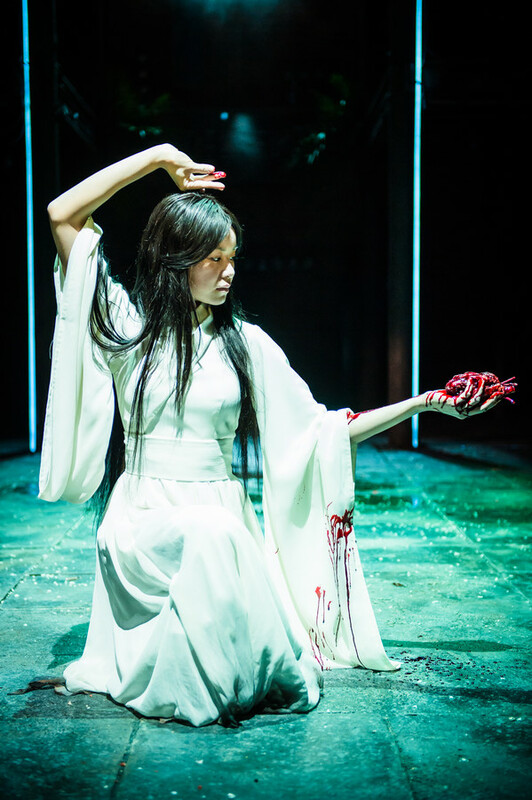 Director Maria Aberg draws Faustus’s inner odyssey like a Dance of Death, a downward spiral, with breathtaking dynamics of expression and movement. The inner and outer world of the lost character, wandering about on the edge, appear in a series of grotesque and fascinating figures that seem to have sprung from intoxicated nightmares: Satan, the Seven Deadly Sins, Faustus’s ghost army that sometimes takes zombie-like features, the faceless Imperial Guard and others create, in conjunction with Orlando Gough’s space setting music, stirring eddies of pictures. 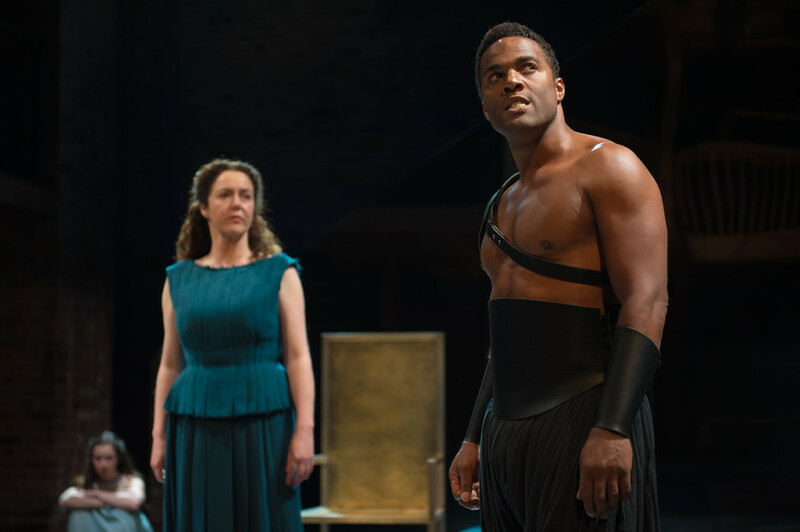 An incredible climax is reached at Faustus’s encounter with the woman of his dreams, Helen of Troy, “the face that launched a thousand ships”. 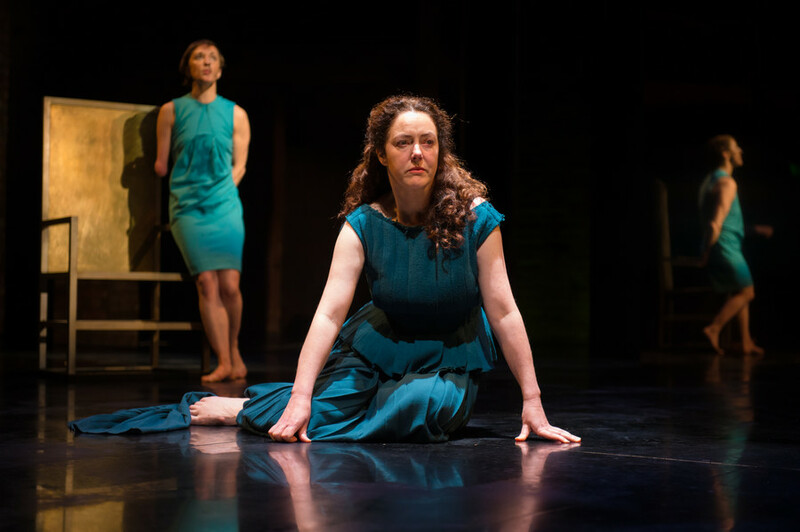 “Give me my soul again,” he pleads with her and their dance, their unlived lives, Helen’s (Jade Croot) and Faustus’s (Sandy Grierson or Oliver Ryan) attempt to connect, is one of those theatre moments with a heartbeat of their own, in which the world comes to a standstill. A production that is disquieting. And that’s a good thing. A deep bow to this ensemble, the director, the music and especially Ayse Tashkiran’s choreography and movement. 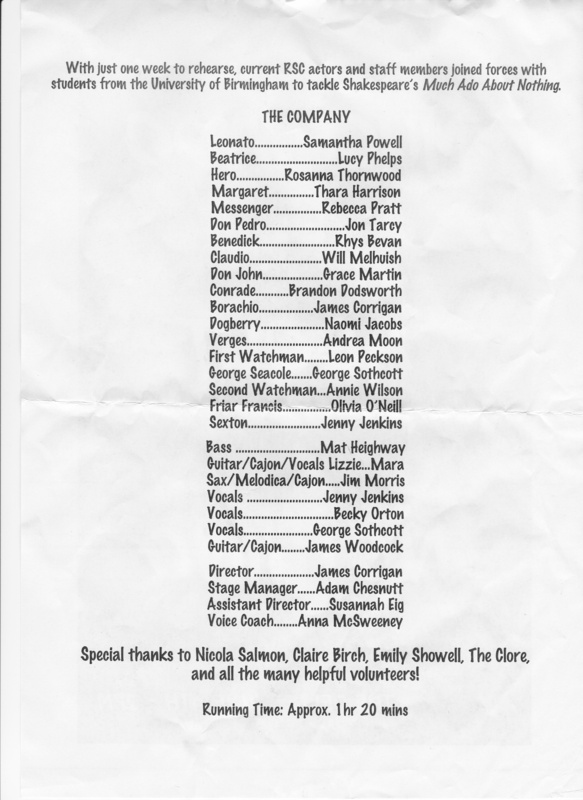 This entry was posted in Theatre and tagged Amy Rockson, Ayse Tashkiran, Bathsheba Piepe, Eleanor Wyld, Gabriel Fleary, Gemma Goggin, Jade Croot, John Cummins, Jonathan Williams, Joshua McCord, Maria Aberg, Naomi Dawson, Natey Jones, Nicholas Lumley, Oliver Ryan, Orlando Gough, Richard Leeming, Rosa Robson, Royal Shakespeare Company, RSC, Ruth Everett, Sandy Grierson, Stratford-upon-Avon, Swan Theatre, Theo Fraser Steele, Timothy Speyer, Tom McCall, Will Bliss on March 13, 2016 by lingonews. Caught in yet another dramatic phase of Britain’s religiously warring royal history, harassed by a fate of 17 continuous miscarriages, Anne ascended to the throne as a rather unlikely contender. Her right to succession and her suitedness were contestable, but she turned out to be England’s lucky card. 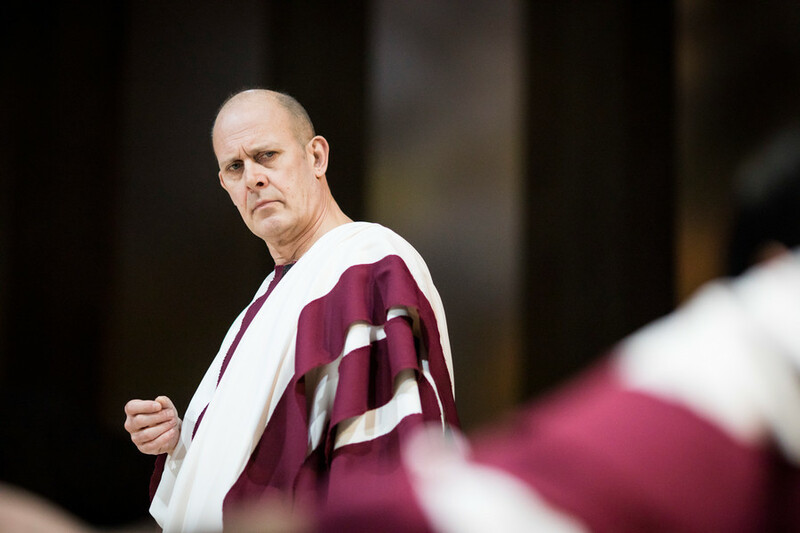 Helen Edmundson’s new play about the last ruler of the House of Stuart before the Hanoverians took over, sheds an intimate light on a lesser known wedge of political drama. 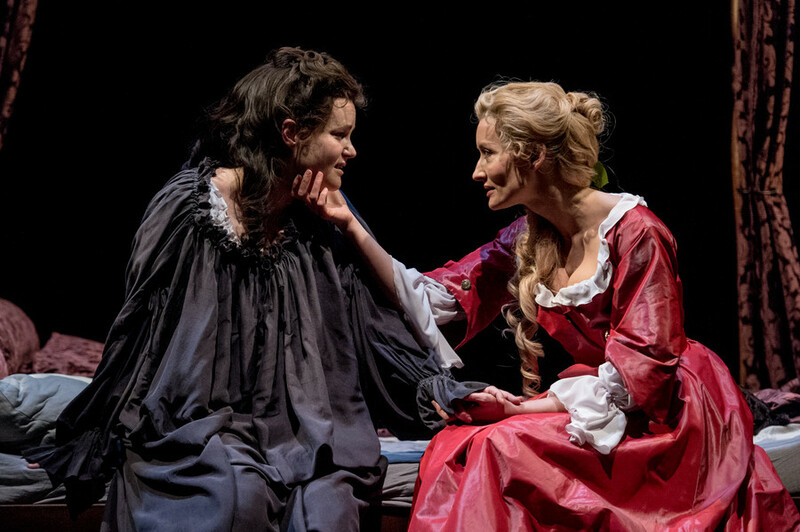 Central to the play is the relationship between Anne and her longtime favourite Sarah Churchill. Sarah, ice-cold and cunning, uses the Queen’s affection for her own and her husband’s, the famous commander John Churchill’s ambition. Natascha McElhone’s Sarah is a controlling, dangerous powerhouse and seems to strew icicles in her path – only when with her husband (Robert Cavanah) and son (Elliott Ross), she switches on a measure of human warmth. Diametrically opposed to her, we find Emma Cunniffe’s Queen Anne. Her portrayal of the journey from being one unhappy dysfunctional incubator not fulfilling her only job of producing protestant heirs, to a still suffering but resolute and caring mother of her subjects is drawn with such tenderness and empathy that one cannot not be magnetised into her emotional struggle. In a smaller role, but just as heart-warming, Hywel Morgan’s Prince George of Denmark, Anne’s husband. His boyish charm, underscored by a lovely Danish accent come over as the consolation poor Anne deserved. Their chemistry is amazing. In parliament, these are the times of the first massive party machinations between Whigs and Tories. The Churchills, together with Sydney Godolphin, the Lord Chancellor (Richard Hope, showing him as dignified and amiable) stand for the Whig faction, whilst Robert Harley, Leader of the Commons, keeps trying to maintain a balance. This latter part is filled with much latent irony by Jonathan Broadbent. His catchphrase “Yes, no, maybe …” ends up being expected impatiently and each time harvests a round of laughs. 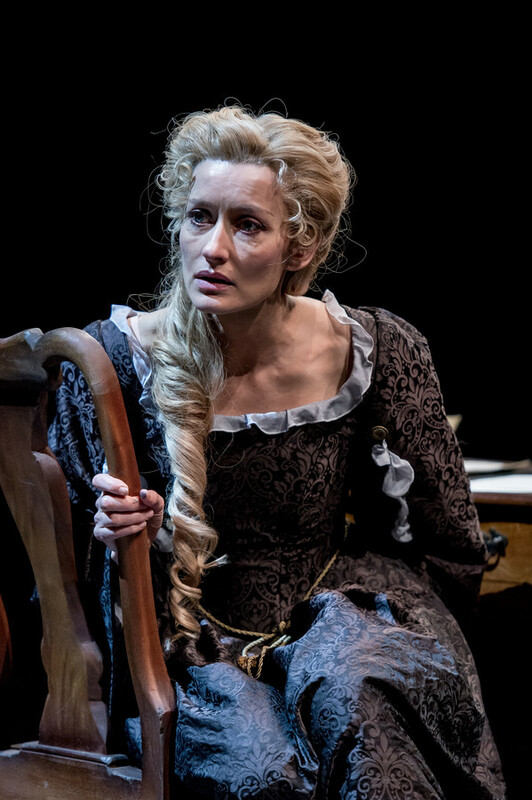 In another likeable role, Beth Parks plays Abigail Hill who starts off as a humble chamber maid and in time earns the Queen’s trust – a neat and lovely performance. 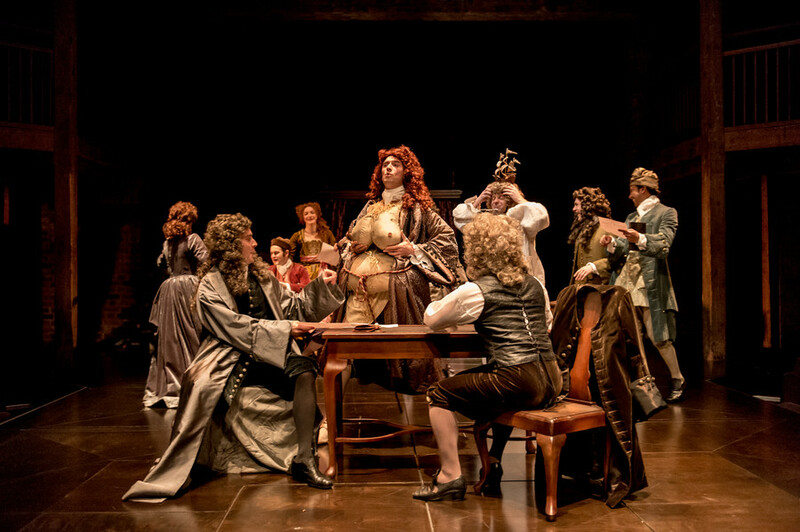 Political satire had a first heyday in this era, three of its protagonists, Jonathan Swift (Tom Turner), Daniel Defoe (Carl Prekopp) and Arthur Maynwaring (Jonathan Christie) complement the production with a hint of carnival and daring lightness voiced in raucous insolent songs. 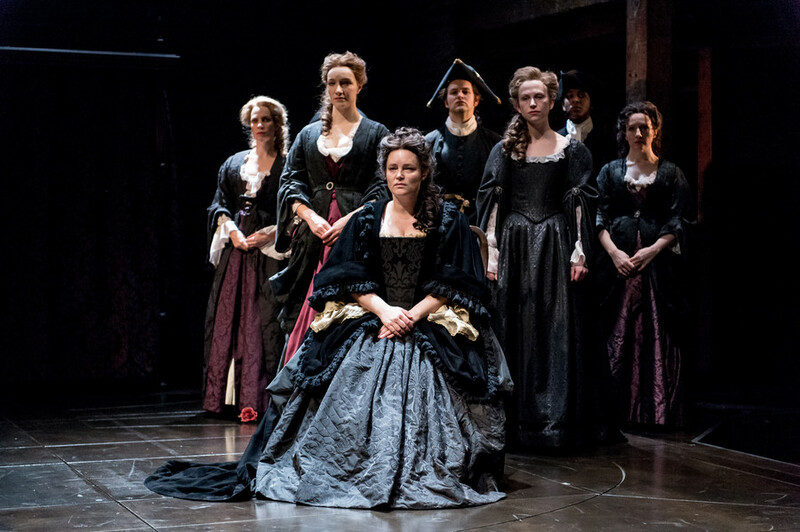 Directed by Natalie Abrahami, Queen Anne is a glorious way to end an RSC year – but also to start a new one, as it runs through to 23 January. Daisy Ashford (Lady Clarendon); Jonathan Broadbent (Robert Harley); Robert Cavanah (John Churchill); Jonathan Christie (Arthur Maynwaring); Emma Cunniffe (Queen Anne); Daniel Easton (Colonel Masham); Michael Fenton Stevens (Dr John Radcliffe); Richard Hope (Sidney Godolphin) ; Natascha McElhone (Sarah Churchill); Hywel Morgan (Prince George of Denmark); Beth Park (Abigail Hill); Carl Prekopp (Defoe/William III); Jenny Rainsford (Jezebel/Lady-in-Waiting); Elliott Ross (Jack Churchill); Anna Tierney (Lady Somerset); Tom Turner (Jonathan Swift); Ragevan Vasan (Groom). 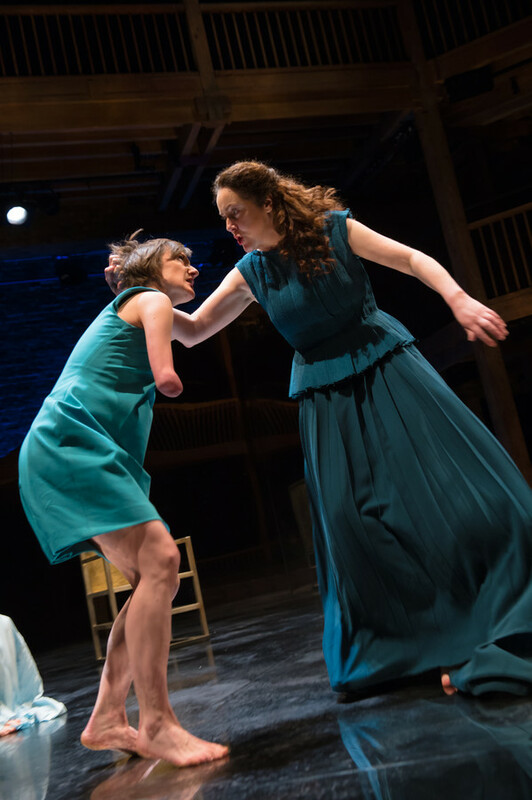 This entry was posted in Theatre and tagged Beth Park, Emma Cunniffe, Hywel Morgan, Jonathan Broadbent, Natalie Abrahami, Natascha McElhone, Royal Shakespeare Company, Stratford-upon-Avon, Swan Theatre on December 22, 2015 by lingonews.